An exercise in empathy through a real-world connection. Seventh grade students (Raul Yzaguirre School for Success, Houston, Texas) wrote letters of condolence in response to the shootings at Sandy Hook Elementary School, Newtown, Connecticut (December 14, 2012). The First Selectman of Newtown responded. Sixth grade students (Raul Yzaguirre School for Success, Houston, Texas) are seen connecting with NASA's International Space Station via EarthKAM (Earth Knowledge Acquired by Middle school students) to request photographs of Earth taken by an onboard camera - STEM stimulus at its best with a real-world connection. "Based on my sensitization to the middle school environment, I feel that there is a need to get our youth's attention today before we begin to talk about education reform. And why do we need to get their attention? Because the majority of them are not paying attention in the conventional or traditional classroom. This is one reason why there is a lot of retesting to force feed our youth to pass the required exams so they can move through the slush gates of education and ultimately out the door. And it seems most school administrations are okay with this as they attempt to fill their state-mandated quotas translated as achievement percentages. The students are the victim, here. They may very well pass their required exams at some point in time, but in order to do so, most go through the process of 'pulling and pushing', if you will, to move them away from their lethargic and aliterate behavior to pay enough attention ... and I emphasize, enough ... to pass. I will leave it up to you to define what passing really means. The lethargic and aliterate behavior in the conventional or traditional classroom is due to two factors: the environmental stimuli via computer technology, media, entertainment, video gaming modes of approach; and the lack of educators being able to acknowledge such, and make amends in the classroom. It seems to me that they need to join the ranks of our youth today, and become 'wired' in the classroom. And if this is approached correctly ... project-based activities via technology applications that cross over into the core subject areas with STEM/STEAM components ... students will participate in and contribute to the educational process for 'real' benefit. And I describe benefit this way because of the practicality of the applications process as a part of the learning activity. Not only will there NOT be a need for retesting, but also an enhancement of skill levels that are required in higher education and at the workplace. Also, another way to increase the attention span of our youth, and improve their outlook or mindset about education is to have digital entities ... computer technology, media, entertainment, video gaming, etc. ... place statements of encouragement on their products targeting students in a general sense to do better with the curriculum, stay in school, and graduate. Since these entities have changed the mental attitudes and pace of our youngsters, they should also nurture our youth to stay in school and get an education. I feel that statements of encouragement on their products would have a great impact on our youth's psyche to begin to think twice about how important getting an education is. This could have an all-encompassing effect on getting our youth's attention. And I feel that this enhanced awareness ... along with technological support in the classroom and tech teaching of teachers ... would begin to turn around the educational process in a more positive light." (Presentation for the Global STEMx13 Education Conference, September 19-21, 2013) Mr. 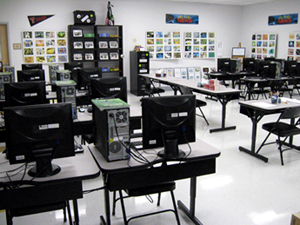 Chambers taught Technology Applications at Raul Yzaguirre School for Success (RYSS) in Houston, Texas, 2007-2013. He also taught and advised after school programming in Digital Photography, Digital / New Media Art and Broadcasting. He is a firm believer in empowering students to take control of the learning process via hardware/software for greater understanding and retention of core subject content. Challenge through engagement is the key to students' interest, and enthusiasm for the educational process. "Provide purpose in the classroom, and students will beg for participation." He is grounded in conventional educational media applications with digital/new media enhancement over the past 10 years. A pertinent connection would be his tenure as Educational Media Manager for Texas Tech Health Sciences Center, 1980-1983. He managed a creative staff, and supported the teaching activities at the Texas Tech Medical School. He also managed media departments for the University of Rhode Island (1983-1985) and the City of Providence (RI) (1985-1990). Nomination for The Library of Congress "Literacy Award/The David M. Rubenstein Prize", 2013. Exemplary Teacher Award (in recognition of outstanding achievements as an ePals educator), ePals, Inc., September, 2011. 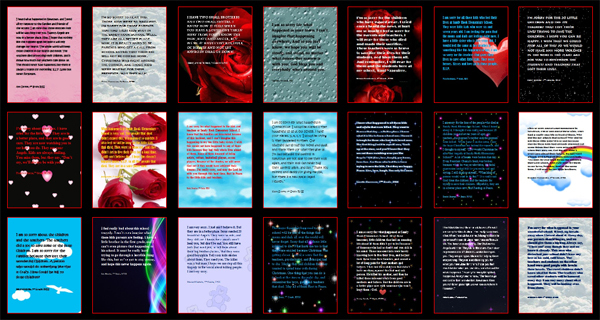 Learning Through the Arts Award (In recognition of excellence and innovation in education as exemplified by Vocabulary Building Through Digital Art; an exceptional project which integrates collaboration, global awareness, and digital skills), ePals, Inc., June, 2010. Certificate of Recognition (for commitment and dedication to teaching), Tejano Center For Community Concerns, Raul Yzaguirre School For Success, Houston, Texas, U.S.A., (2008-2009), May 15, 2009. Students are seen broadcasting Panther News at Raul Yzaguirre School for Success (Houston, Texas), a consistent process throughout the school year to build self-confidence and enhance public speaking skills. Certificate of Honor (teaching and promotions contributions), Fine Arts Department, Zhaoqing University, Zhaoqing, China, 2005 - 2007. Commendation (teaching contributions), Foreign Languages Department, Sheng Da College, Zhengzhou, China, 2003 - 2005. 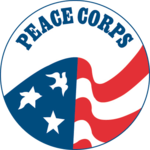 Commendation (institutional and community development), United States Peace Corps, Zimbabwe, Africa, 1993 - 1995. Youth Leadership Award (youth development), Metro Arts/Smith Hill Center, Providence, Rhode Island, U.S.A., 1991. Mayor's Citation (community work - youth development), City of Providence, Providence, Rhode Island, U.S.A., 1989. Commendation (communications work with high school students - Crosbyton High School, Crosbyton, Texas, U.S.A.), Region 17 Education Services Center, Lubbock, Texas, U.S.A., 1980. State Award (journalism and photojournalism for high school newspaper - adviser to students, Crosbyton High School, Crosbyton, Texas, U.S.A.), Lubbock, Texas, U.S.A., 1980. First Place Award (photomicrography), BioCommunications Association, Galveston, Texas, U.S.A., 1974. First Place Award (best technical paper published in a national scientific journal, LAS), AALAS, Houston, Texas, U.S.A., 1971. "Be a visionary teacher - will lead to future, visionary leaders - those students sitting in the classroom." 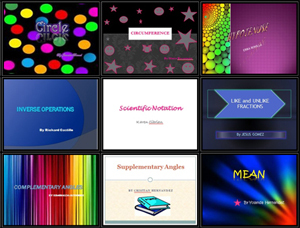 Seventh grade students (Raul Yzaguirre School for Success, Houston, Texas) used PowerPoint to create presentations based on Grade 7 Math concepts. The students were challenged to take control of the learning process to make Math more exciting and interesting to study. They researched the concepts online, and then used visuals, text and animation to bring them "to life". "Challenge your students to take control of the learning process for a sense of relevance and ownership." "Technology should facilitate, make pedagogy exciting to motivate, engage, and empower the student for greater understanding/retention." "Part of the education dysfunction is the lack of concern by most media entities to encourage education as they inundate youth with their product." "WHATEVER for our students today is a very real concept, for them, stemming from an attitude ... indifferent ... created via media that everything's cool." Mr. Chambers is a RPCV (Zimbabwe, 1992-1995). 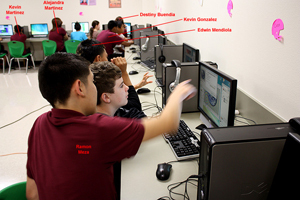 Eighth grade students (Raul Yzaguirre School for Success, Houston, Texas) are seen teaching intermediate students (Dublin ISD, Dublin, Texas) how to use graphic arts software to visualize Space weather and the NASA MMS 2014 mission for greater understanding and retention of content. Eighth grade students (Raul Yzaguirre School for Success, Houston, Texas) are seen teaching third grade students (Harmony Hills Elementary School, San Antonio, Texas) how to use graphic arts software. Mr. Chambers feels that showcasing students' work is a very effective way to motivate them (students) to want to participate in and excel at assigned curriculum. As they peruse their various projects and product (item as an end result) en masse and as a collective body or group of individuals working towards one common means (goal), there is a sense of team achievement. Personally, there is a variety of tags that can be applied to the psyche: self-esteem, pride, relevance (purpose), ownership, achievement, completion (closure). This team feeling and these tags ... and more ... are important for participation and follow-through within higher education and at the workplace. The collection of work can also be used as learning tools for others. The waves of new students that "pour" into the classroom, semester after semester, year after year, can view and use the collection (other collections) as a guideline (template). What is probably more important is the fact that the collection becomes a motivational tool for the new students to participate and achieve in a competitive sense as they are tasked to work on similar projects. 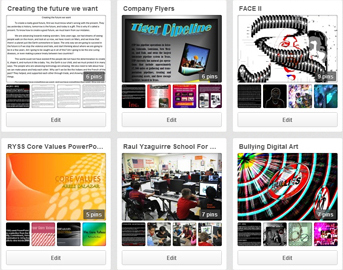 Various projects and products by seventh and eighth grade students (Raul Yzaguirre School for Success, Houston, Texas) are seen in this screen capture, courtesy of Pinterest. "Showcase your students' products – they become motivators and great teaching tools for the next wave." Visualize content with a purpose. 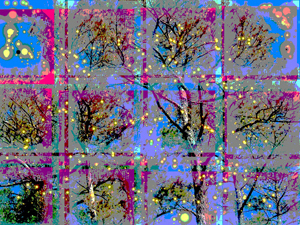 Seventh grade students (Raul Yzaguirre School for Success, Houston, Texas) manipulated photographs (taken by other RYSS students) via graphic arts software to make Digital Art for a fundraising activity to support the school and the community. This Digital Art piece is by Tiffany Cedillo. The photograph was made by Jovany Aguirre. The classroom setting is important to Mr. Chambers. It should be "filled", and "busy" with a sense of relevance and achievement. There should be a curatorial aspect to display that adds meaning and value to students' work as an incentive to continue with the educational process. It should be surround and tactile - providing excitation - giving purpose and direction to behavior - and nurturing the learning process. These photographs show Mr. 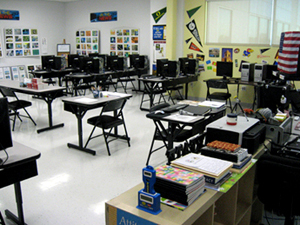 Chambers' Technology Applications classroom at Raul Yzaguirre School for Success, Houston, Texas (2012 - 2013). Mr. 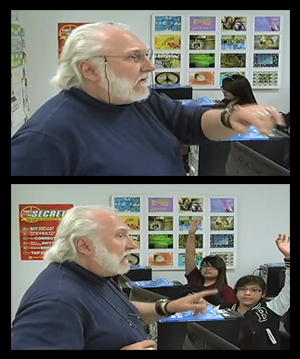 Chambers is seen in action along with his students (Raul Yzaguirre School for Success) in these screen captures from video coverage by a local television station in Houston, Texas. They (TV crew) were there in response to Mr. Chambers being selected as a member of one of the teams to develop curriculum for the study of Space weather and the NASA Magnetospheric Multiscale mission, 2014. "There's nothing greater than the power of a photograph to help students write (Literacy Through Photography [LTP])."